The Rockwell RK3440K is a circular saw that stands out from the crowd for a number of reasons. First of all it’s very small – with a 3-3/8 inch blade, this saw is among the smallest you can find. Secondly, it has a surprisingly powerful motor with 4 amps and 120 volts, which is capable of rotating the blade 3,500 times per minute. On top of that, the circular saw comes with all sorts of useful features that will make cutting wood and similar materials feel like a fun game. 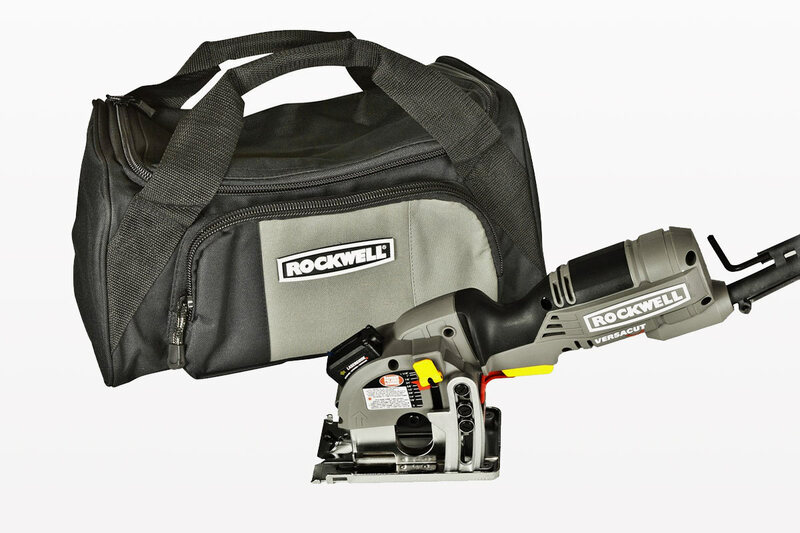 The Rockwell RK3440K comes with 3 different blades, making it suitable for cutting all different kinds of material – wood, aluminum and sheet steel, cement backer board, marble, concrete, PVC, etc. The maximum cutting depth this saw can make is 1-1/16 inches (on wood). But cutting deep is not what this saw is all about – it’s more about providing you with easy and precise cutting. That’s why it comes along with a laser, which will help you cuts as precisely possible. As we’ve already mentioned, the saw can be used for cutting different materials. It all depends on the saw blade you use. That is why there are three different blades included in the package. Putting them on is quite easy, as you have all the tools you need. The saw comes with a pair of wrenches, so changing blades can be done a matter of seconds. Another useful feature of this saw is that it comes with a vacuum port. While cutting, you are bound to spread tiny particles all over the place – including on the outside and inside of your saw. This can cause a lot of problems with your motor. The good news is that Rockwell RK3440K comes with a dust collector, which will make this problem disappear. Should You Buy Rockwell RK3440K Circular Saw? Depending on the cutting task you want to do, this great circular saw might be the perfect tool. Sometimes you won’t be able to use a larger saw, so the Rockwell RK3440K would come in handy. You can’t think of this saw as your primary tool, but given the fact that Rockwell RK3440K is a very affordable product, nothing is preventing you from adding it to your tool set.